Americans continue their growing love affair with streaming media players. 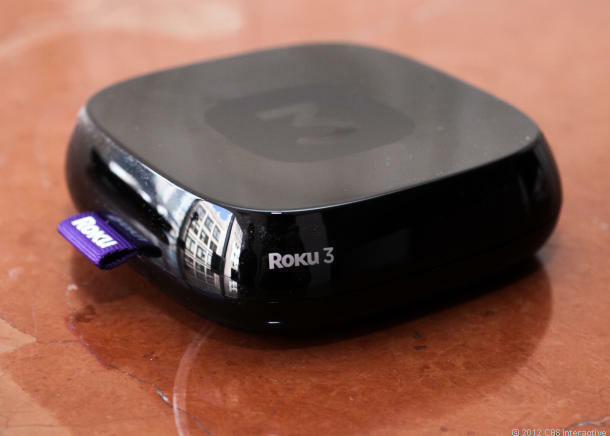 According to a recent study, these devices – Roku, Amazon TV, Apple TV, Google Chromecast, etc. – are now in almost 40 percent of all U.S. homes with broadband service. Cord-cutting consumers prefer to stream TV shows and movies instead of paying a large monthly cable bill. A Roku streaming media player. Photo copyright Roku. News about the study on the rise of streaming media player usage appeared this week in Telecompetitor. Read further to see if you and your family need to join this bandwagon. It’s a great way to take full advantage of your home Internet service. The streaming media study from Parks Associates includes a data point making the rapid growth of this market quite obvious. In 2010, six percent of U.S. homes with high-speed Internet service owned a streaming media player. As of last year, that number grew to nearly 40 percent. Kristen Hanich, a research analyst for Parks, commented on the reasons behind this consumer growth. “Since their inception about a decade ago, consumers have purchased streaming media players due to their modern and friendly user-interfaces, wide app support, and low cost, making them easier to upgrade and replace than a television set,” said Hanich. She also noted the most popular streaming players are the Roku, Apple TV, and Amazon Fire TV. Their ease of use and robust feature sets obviously also matter to consumers. The Google Chromecast comes in fourth place among installed households. The Parks Associates study also noted fewer households stream using video game consoles, like the Sony PlayStation. Additionally, over 50 percent of U.S. homes own a smart TV, which also provides streaming. Half of those smart TV owners also own a streaming media player. In short, expect this market to continue to grow for the rest of the decade and beyond. It remains one of the reasons Netflix, Hulu, Sling TV, and other streaming services are popular. Make sure you own enough HDMI cables to power your home theater! Which Streaming Media Player makes sense for My Family? If you are an Amazon Prime member, the Fire TV definitely makes sense. This same rule applies for the Apple TV at households with iPhones and iPads. The Roku provides a platform agnostic experience compared to those other streaming media players. For example, some users find it difficult to search for content from other services when using an Amazon or Apple media player. So keep this in mind when shopping for your own streaming device. Support for 4K video and HDR is another factor worthy of consideration. Most higher-end players offer these features. Also consider voice remote control features. If you are used to Alexa or Siri, consider an Apple TV or Amazon Fire TV unit. The Roku Ultra also offers voice control functionality. More inexpensive units like the Roku Express or the Amazon Fire TV Stick provide fewer features. Ultimately, the most important thing is to perform your research! Once again, streaming media players let you get the most out of your Internet service. They also save you money on monthly cable or satellite TV bills. Some devices even play video games! Maybe you need to put a Roku Ultra or Amazon Fire TV on your shopping list? Stay tuned to Bandwidth Place for additional insights on broadband Internet service. We even help you test your Internet speed!